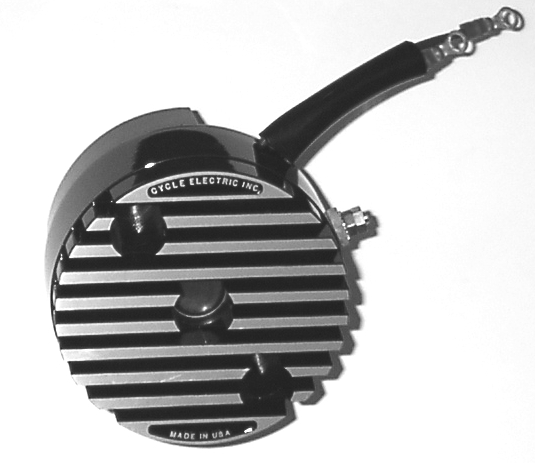 The CE-540 was adapted from the CE-500 to fit on the Model 65A generators. Adding this to your existing generator will make it perform like a DGV-5000 as long as it is not a weak generator. The housing of the CE-500 series is a structural part of the generator containing one of the armature bearings. The regulator controls voltage and limits current (amps). The current limiting circuit senses armature temperature and limits the current in an inverse proportion. Temperature goes up, amps go down. This gives you more amps after a cold start to recharge your battery faster (5 minutes instead of 20). Yet protect against over heating (armature burn out). CE-100 Series regulators accurately control voltage and current. Accurate voltage control is necessary to maintain proper battery charging rate. Accurate current control is very important to get maximum power without causing generator damage. All Cycle Electric Inc Regulators are built to last.We start with a rugged design capable of handling overloads and continuous operation. Then we use only top quality materials and military spec. assembly process to ensure a low failure rate and the longest service life. 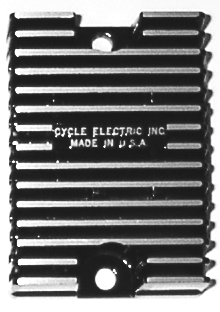 A CE-101 Replaces Mechanical 1958-1964 XL, XLH, XLCH, FL & FLH. 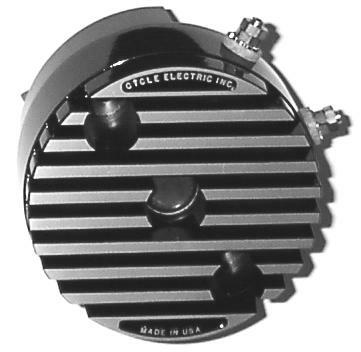 A CE-102L Replaces Mechanical 1936-1964 12 volt conversion when using small 12 volt battery in horse shoe oil tank. B CE-104 74504-78 1878-1981 XLH, XLCH, XLS.